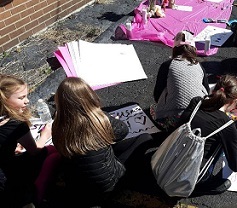 Family and friends gathered to show their love and support for Donna Dalton who was murdered by former Columbus Police vice officer Andrew Mitchell at the site of a vigil, Saturday, March 23. Justice will only be served until Andrew Mitchell and those high ranking officers within the Columbus Police Department who have known for years about the ongoing corruption within this division are all placed in a cell. #Justice4Donna.